The 8th Annual Lend an Ear, Come and Hear reading event is in just a couple weeks on July 8, 2017. The submissions this year have been wonderful, and we’ve narrowed them down to about 20 writers who will be reading their stories, poems, and prose for free at Plum Hill Winery in Gaston, Oregon. Come join us for this delightful storytelling and author reading event. There will be food trucks and plenty of wine to enjoy on the hillside surrounded by nature and this beautiful winery in the Tualatin Valley. The 8th Annual Lend an Ear, Come and Hear reading event is July 8, 2017, at Plum Hill Winery in Gaston, Oregon. It begins at 10:30AM and goes to approximately 1PM, and is produced by Writers in the Grove. For eight years, writers from around Forest Grove and Washington County have submitted and read their work to dozens. Last year we broke records with over a hundred attendees. This free event is held in a beautiful winery in the foothills near Hagg Lake overlooking the Tualitin Valley. There will be food from several food wagons and, of course, some wine from Plum Hill Winery, our fabulous hosts. Come laugh, cry, and sigh as you listen to our marvelous readers sharing their creative writing and storytelling skills. Enter Your Submission: If you would like to participate as one of our readers, submit your poems or prose of four-minute readings per the instructions on our submission form for Lend an Ear, available as a downloadable Word document or PDF file to complete and return to Writers in the Grove by June 12, 2017. Submissions must be original and able to be read out loud for no more than 4 minutes. This is a juried event. Pieces will be selected on the basis or originality, writing style, and quality of work. All genres are welcome, however, they must be family friendly. Submissions should reflect content suitable for mixed age groups. Come join Writers in the Grove for this fun, family event at Plum Hill Winery. The deadline for Wintersong submissions is December 15, 2016. If you have a written piece that can be read out loud in four minutes or less, you are welcome to submit it for consideration, but it must be received or postmarked by December 15 to be considered. We’re looking for prose, poetry, or songs that are family-friendly. Get your submission in by December 15 to be considered for the January 21, 2017, reading event presented by Writers in the Grove and held at the Forest Grove United Methodist Church at 10:30AM in Forest Grove, Oregon. The event is open to the general public and free, as are the submission entries. Even if you do not submit an entry, we’d love to have you join us, so mark January 21 on your calendar. For more information and the entry form, see our announcement and submission form. 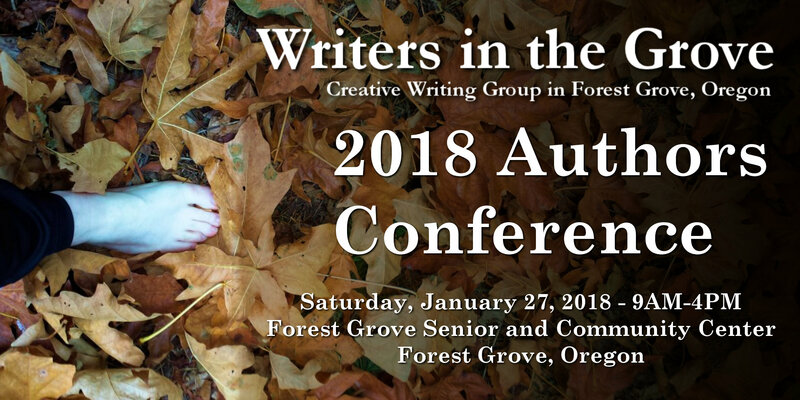 Writers in the Grove has been invited to be a part of the Forest Grove United Methodist Church’s Cultural Events Series with our Wintersong annual reading. The event is Saturday, January 21, 2017, from 10:30AM to about noon. The event is open to all ages. It is free to enter and attend. Wintersong is one of two annual readings presented by Writers in the Grove. Wintersong happens in January, and Lend an Ear is in July. It features local writers reading their works. The event’s guest moderator will be Ron Field, keeping the show flowing smoothly. If you would like to join us and share one or more of your written pieces, you must have your submission entry mailed in and postmarked by December 15, 2016. Submissions are limited to one or more pieces of prose, poetry, or songs that can be read out loud within four minutes. Entries must be original, written by the applicant, and must not infringe any copyright or other proprietary rights. Entries will be selected on the basis of originality, writing style, and quality of the work. Decisions of the Selection Committee are final. All genres are welcome, subject to the following filter: This is a family-friendly event. Submissions must reflect content suitable for a mixed-age audience. Content and submissions deemed inappropriate will not be considered. If your entry is chosen, you will be notified no later than January 8, 2017, and you will read your entry at the event on January 21, 2017. For the submission guidelines and entry form, please download the form (PDF). There is no entry fee for submission. As a reminder, Lend an Ear, Come and Hear is July 9, 2016, at Plum Hill Winery in Gaston, Oregon. It begins at 10:30AM and goes to approximately 1PM. Local writers submitted their four-minute readings and we have a fabulous collection of short stories and poems this year. Local authors will be selling their books, and the pizza wagon will be available for food. We are very grateful to Plum Hill Winery for once again providing such a beautiful outdoor venue. And their wine is pretty awesome, too! You can find more information and details in our announcement and on the Lend an Ear, Come and Hear site. Writers in the Grove invites you to attend our 7th Annual Juried Reading Event, Lend an Ear, Come and Hear 2016, at Plum Hill Winery in Gaston, Oregon, on Saturday, July 9, 2016, from 10:30am until the last reader (typically ends about 1pm). The event is free and open to all ages. A pizza wagon will be on hand for those wishing to stay for lunch, and the winery will be open with wine, soft drinks, and snacks. Submissions must be family-friendly and are limited to 4 minutes out-loud reading time. Applicants are limited to one or more pieces of prose or poetry, must be original and written by the applicant, and not infringe upon any copyrights. Submissions will be reviewed for acceptance by a Selection Committee and authors of accepted pieces will be notified no later than June 30 for the July 9th event. Again, we invite everyone to come join us in the beautiful Plum Hill Winery for this special event featuring local writers sharing their brilliant work for free. Plum Hill Winery is located at 6505 SW Old Hwy. 47, Gaston, Oregon, just off Old Highway 47 south of Forest Grove. Download and print Lend an Ear Application 2016 (PDF) to submit your entry by June 13, 2016. Wintersong is Writer’s in the Grove’s First Annual Juried Winter Reading Event on Saturday, January 16, 2016, a public reading in the Mt. Jefferson Room, Jennings-McCall Center, 2300 Masonic Way, Forest Grove, OR, from 1:30 PM to about 3:00. Writer’s in the Grove is currently accepting submissions from writers of one or more pieces of prose or poetry that can be read aloud within four minutes. Entries must be original, written by the applicant, and not infringe upon copyrights. Selection is based upon originality, writing style, and quality of work, and humor is appreciated. Some preference may be given to authors who’ve never read at Lend an Ear. Submissions must be family friendly. To enter your submission, please use this Wintersong Submission Application 2015-2016. The event is open to the public, free, and welcome to all. Please join us for a delightful afternoon on Saturday, January 16 at 1:30PM.